​This full-color, soft-cover book brings together a lifetime of sawmill experience and technical training to help readers solve lumber manufacturing problems and save money. It includes chapters on wood quality and characteristics, softwood lumber grading, logs for fine face veneer, wood residues and potential markets, sales techniques and more. 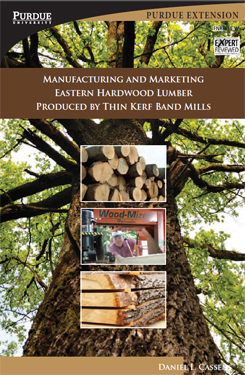 It is a comprehensive reference guide for those who manufacture and market Eastern hardwood lumber in the United States. While it’s written for owners of small, home-based lumber mills, the information is also useful for traditional lumber manufacturers.The author has spent 30 years in close association with both the hardwood lumber and veneer-producing industries, as well as with the users of hardwood products. He has participated in hundreds of plant visits, organized and conducted many educational seminars and written extensively. This 380-page book was produced in conjunction with the U.S. Forest Service. View sample pages of the book or place an order through The Education Store, Manufacturing and Marketing Eastern hardwood Lumber Produced by Thin Kerf Band Mills.